On the occasion of EXPO CHICAGO 2016, Zuecca Project Space is proud to present the solo presentation of the ongoing multimedia project “Monologues” by Italian sound artist Michele Spanghero. The main work showcased at the booth #826 of Expo Chicago 2016, from the 22nd to the 25th of September 2016, is the video installation “Fenice” (2016), produced by Zuecca Project Space, and presented in partnership with the Italian Cultural Institute in Chicago, with the kind support from Ritz Saddler and Hausbrandt. “Monologues“, started in 2014, is a project focused on the correlation between space and sound in historic theaters, featuring the silent voice of architecture by recording the acoustic resonance of the empty halls. Twelve among the most important theaters in Italy have been involved in the project to date. 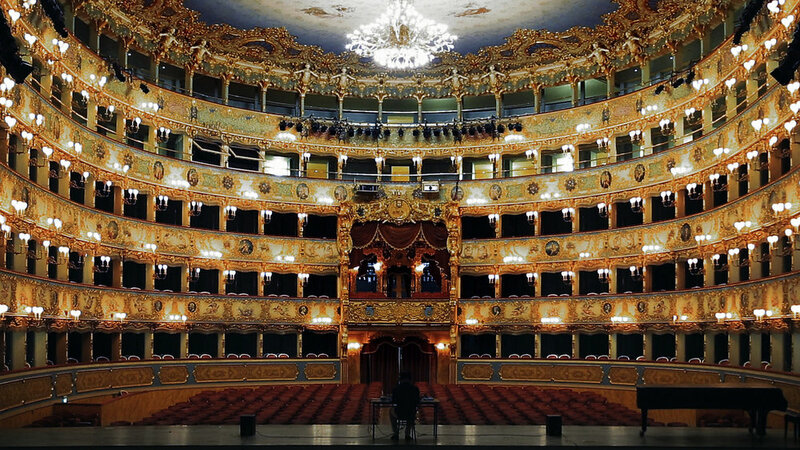 “Fenice” (2016) shows the process of ambience recording of the empty Gran Teatro La Fenice in Venice. The video starts in darkness to listen to the silence of the empty theater, but, as the sound rises, the lights slowly grow up to reveal the theater hall and, in backlight the artist alone on stage, carefully listening to the sound of the resonant voice of the opera house. The multimedia project “Monologue” consists also in sound sculptures and a photo series of empty theaters where the only visual element of interference is a microphone, alone on stage. EXPO CHICAGO, the International Exposition of Contemporary & Modern Art, opens the fall art season each September at historic Navy Pier. Entering its fifth edition in 2016, EXPO CHICAGO presents artwork from 140 leading galleries from around the world, and includes EXPOSURE, Special Exhibitions, /Dialogues panel discussions, EXPO VIDEO, as well as IN/SITU and IN/SITU Outside and EXPO Projects. Michele Spanghero (Gorizia, Italy 1979) graduated in Modern Literature at the University of Trieste, throughout the years he has attended workshops on music, sound design and video making. His artistic activity focuses on the relationship between space and perception investigated through sonic arts and photography. «Michele Spanghero is among the best young European artists who focus their research on sound» (M. Pierini – Director of the National Gallery of Umbria). He has exhibited his works in various international venues such as Darb 1718 Center (Cairo, ET), Museum of Modern Art (Istanbul, TR), MAGASIN Centre National d’Art Contemporain (Grenoble, F), Stroom Foundation (The Hague, NL), Festival Tina-B (Prague, CZ), Vžigalica Galerija (Ljubljana, SLO), Academy of Fine Arts (Cincinnati, USA), Italian Embassy (Brussels, B), Galerie Mazzoli (Berlin, D), MaRT Contemporary and Modern Art Museum of Trento and Rovereto (Rovereto, I), Bevilacqua La Masa Foundation (Venice, I), National Gallery of Umbria (Perugia, I), Temple of Hadrian (Rome, I), Galleria Civica (Modena, I) and was recently selected to take part into the upcoming 16th Quadriennale in Rome.